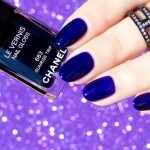 Purple nail designs have an element of mystery that few other colours can convey. Purple combines the calm stability of blue and the fierce energy of red. Often associated with royalty, purple symbolizes power, luxury, nobility, and ambition. It also conveys wealth, extravagance and also wisdom, creativity, mystery and magic. Purple can be easily paired with any other shade of purple or cool colour and it looks so flattering on. Thus, getting purple on your nails is a good idea at any given time! 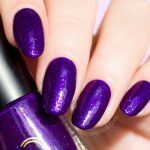 So take a look at these 12 magestic purple nail designs that will add a touch of mystery and nobility to your appearance. 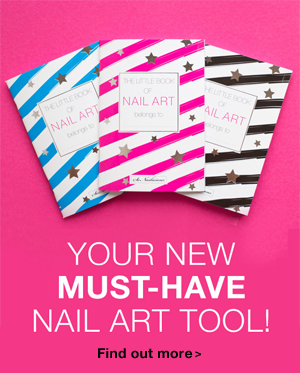 And fear not, all these designs can be re-created with a couple of simple tools and my how to guides, even if you’re new to nail art. How to: create abstract pattern with dry brush technique using an angled nail art brush, then apply gold flakie foil and studs and secure your design with a high gloss top coat. 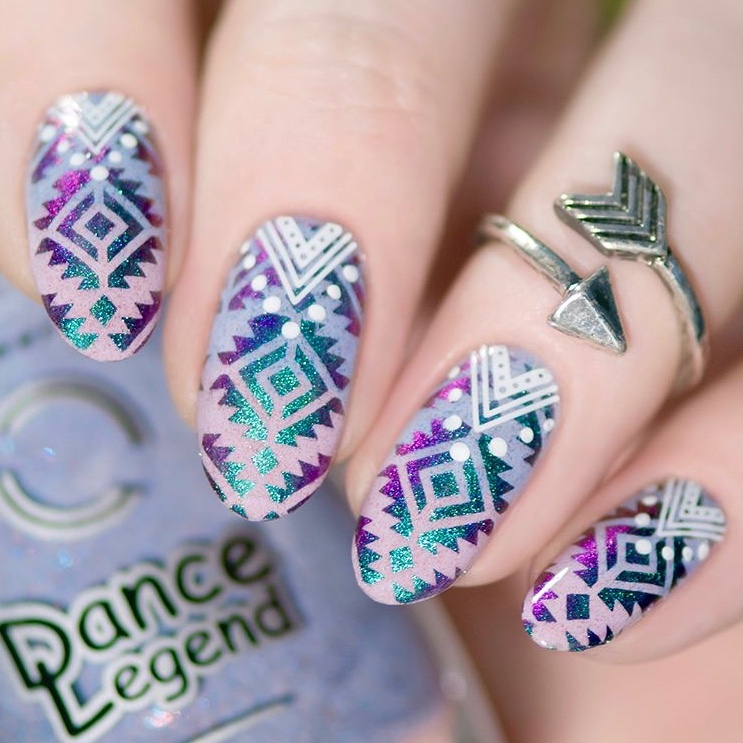 How to:first, create gradient with light and dark purple nail polishes, once dry apply white Geo Aztec nail stickers and finish your manicure with a glossy top coat. How to: simply follow this two tone nails how. 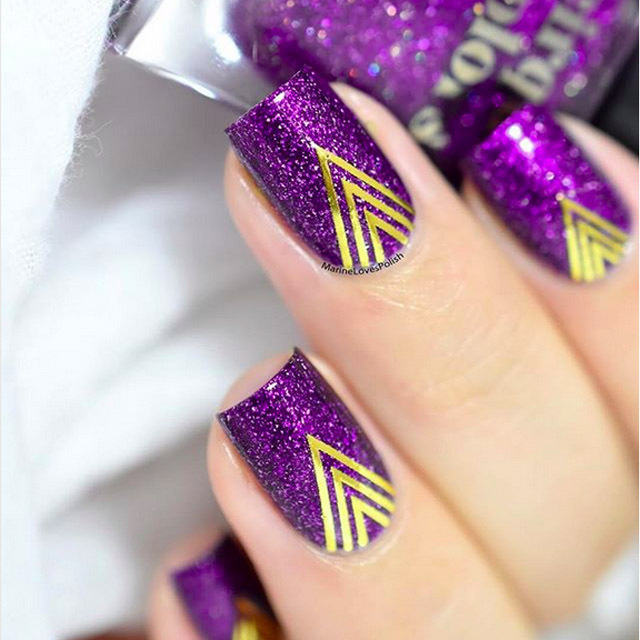 How to: simply paint all nails with shimmering purple nail polish, once dry add gold Chevron stickers and secure your mani with a top coat. 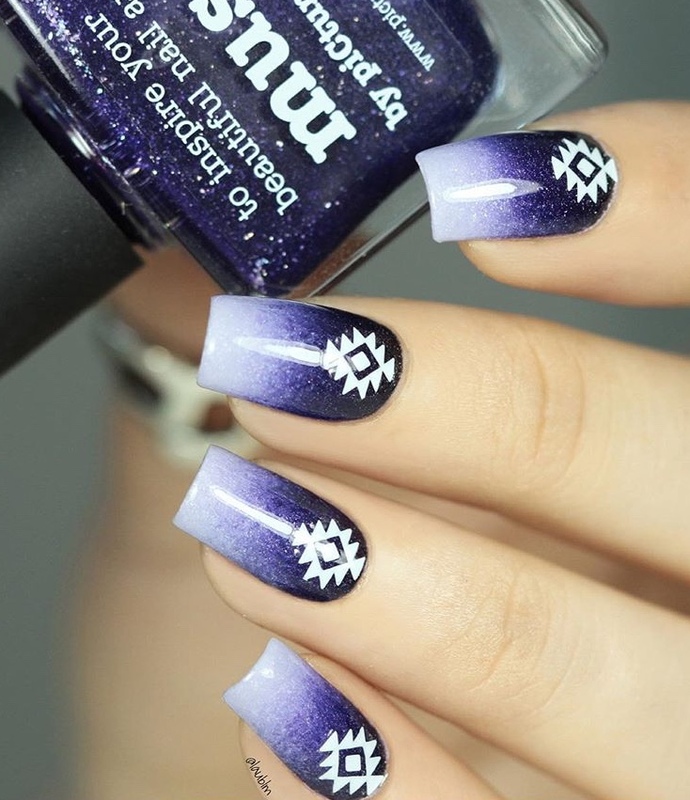 How to: first, create a violet to purple gradient (if you need a tutorial, see this gradient nails how-to in the book), then add dark or gunmetal glitter to the tips. Finish with 2 layers of a glossy top coat. 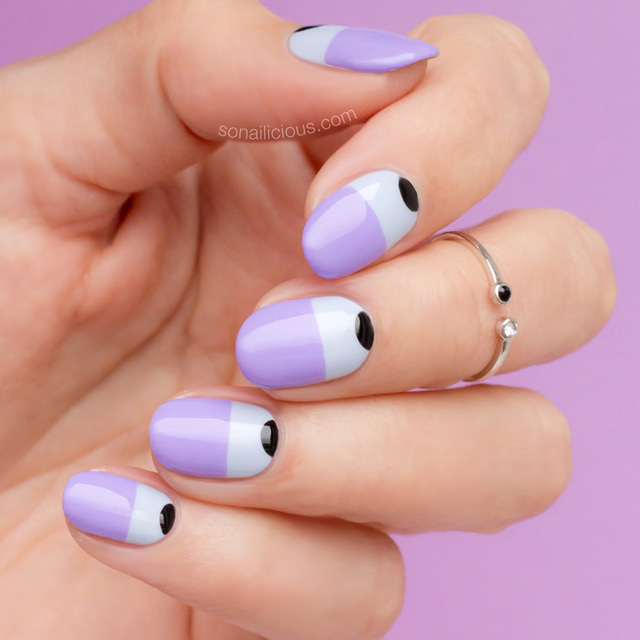 How to: create gradient with pink and light purple nail polish, then stamp over it with a chrome powder, apply one coat of a top coat and then apply white Boho nail stickers as pictured. Finish your design with a glossy top coat. 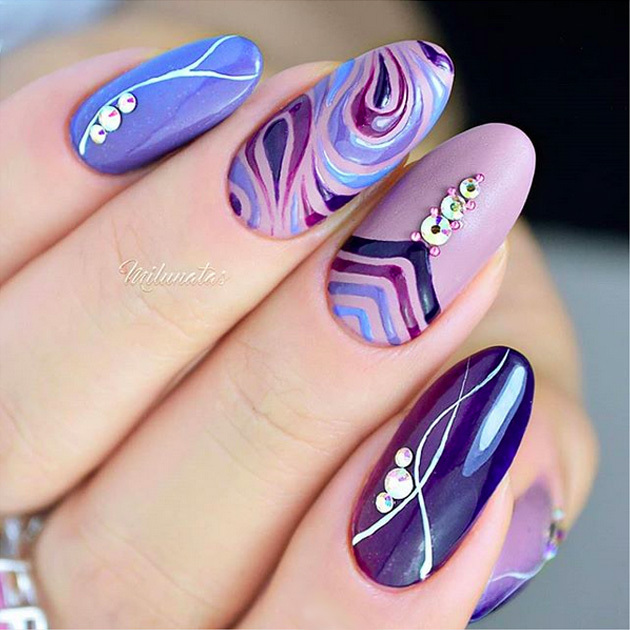 How to: this stunning purple nail design is entirely hand-painted with a fine liner nail art brush. 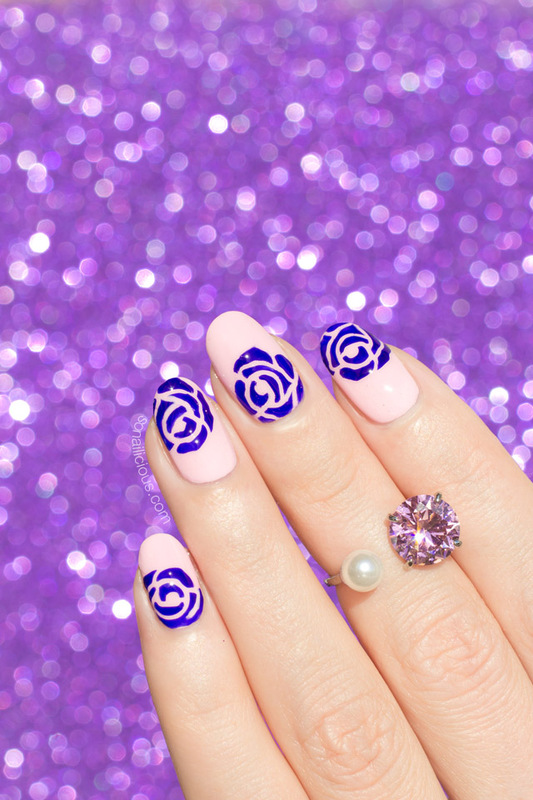 How to: paint all nails in pink, wait until it’s dry and then using rose nail stencils, detailing nail art brush and purple jelly nail polish add roses. Finish your nail design with a high gloss top coat. 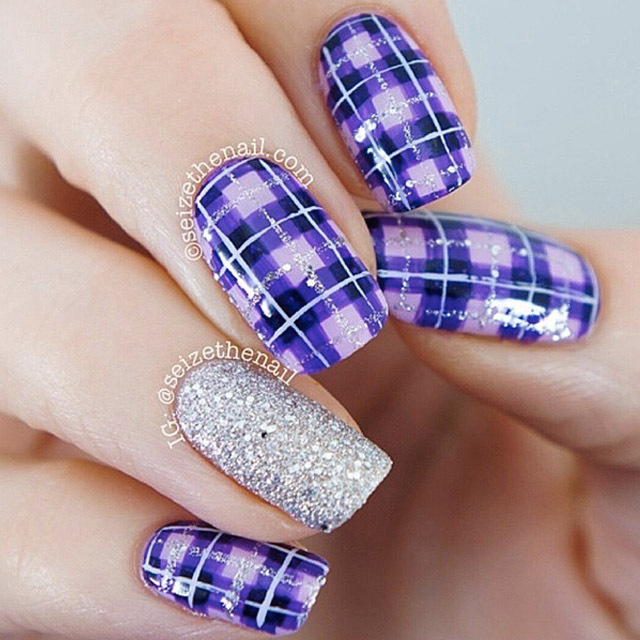 How to: simply follow this Plaid nail art tutorial. 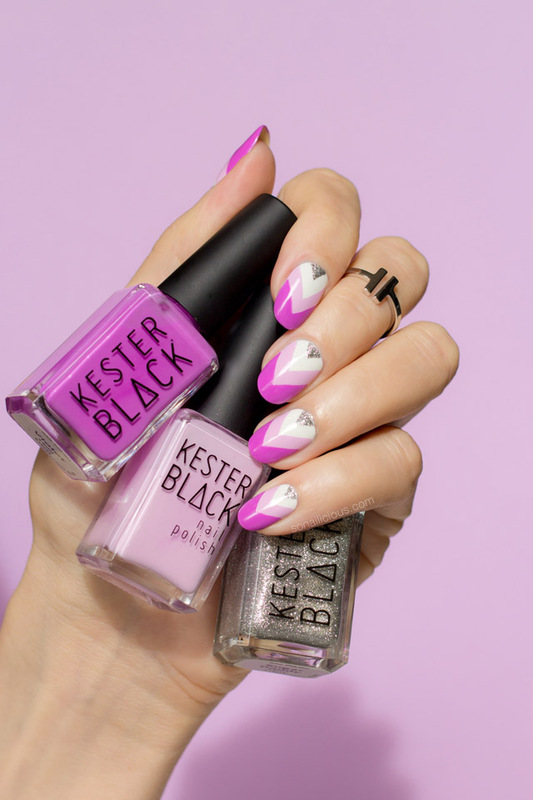 How to: paint all nails in white, then using liner nail art brush and Kester Black Fairy Floss add light purple chevron details and then with Kester Black Violet add dark purple tips. Finish by adding silver glitter triangles and securing your design with a high gloss top coat. 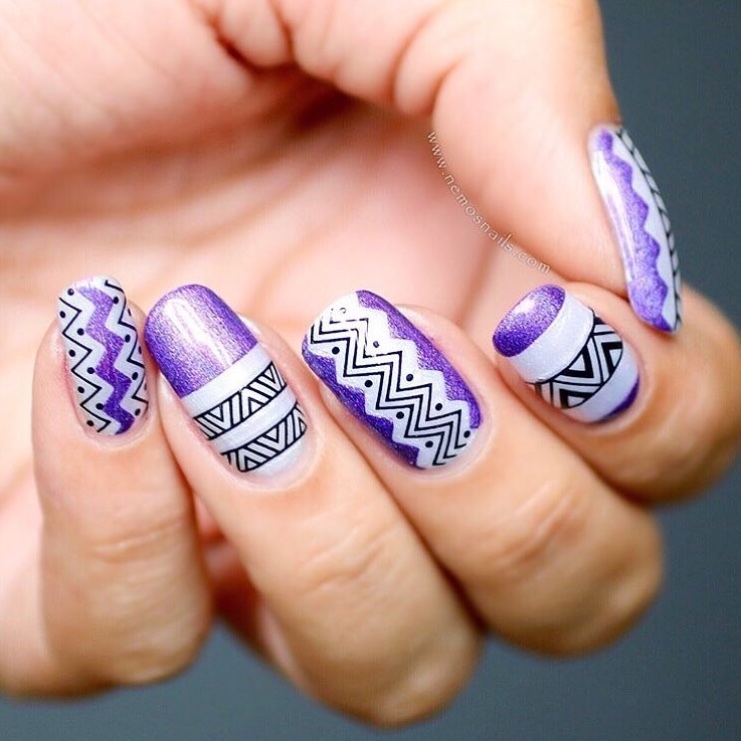 How to: paint all nails with light purple nail polish, then use nail stencils to create geometric patterns with dark purple nail polish and apply black Geo Aztec nail stickers as pictured. 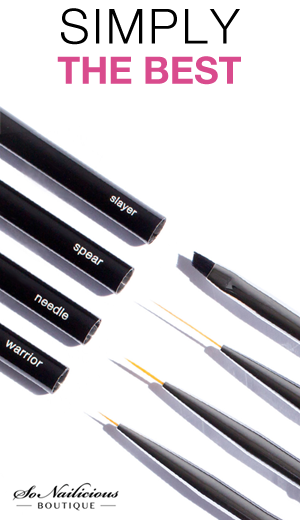 Finish your design with a top coat. 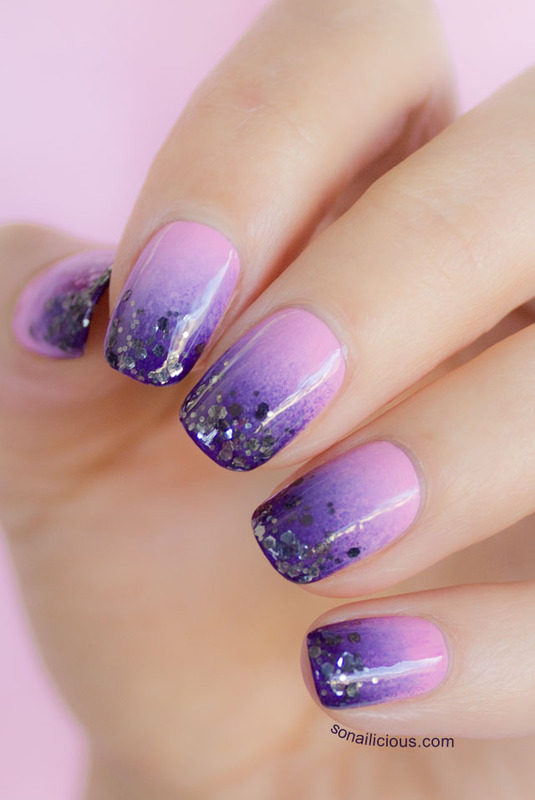 How to: simply apply glitter star stickers over light purple nail polish. Finish your manicure by applying one coat of a glossy top coat. 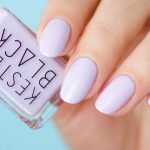 There you have it, 12 chic purple nail designs to try! 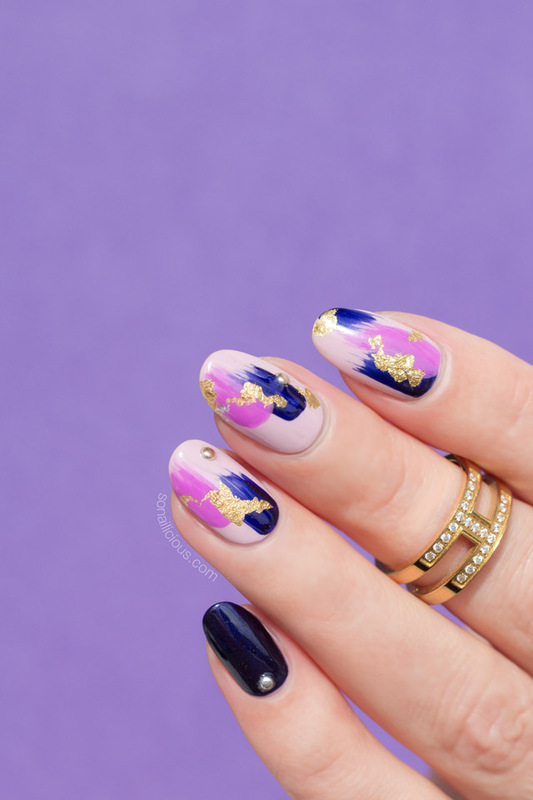 With all these gorgeous manicure ideas, it’s easy to embrace your inner royalty with any shade of purple depending on your style and mood. 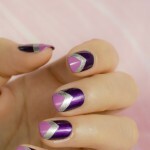 I especially like shimmering purple nails with gold chevrons – the design looks minimal and extravagant at the same time, and it’s so easy to do, I have to give it a go. 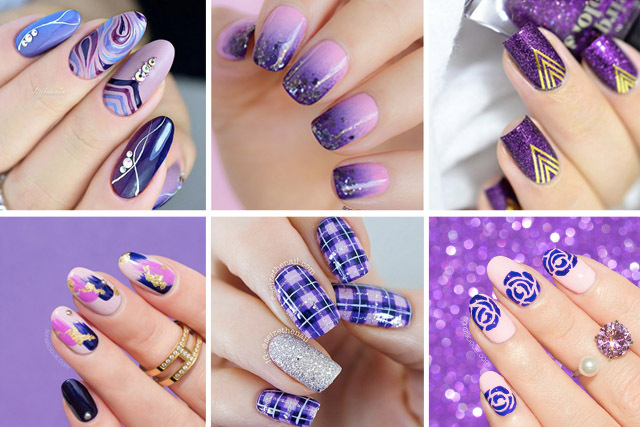 Which purple manicure from the above compilation is your favourite?